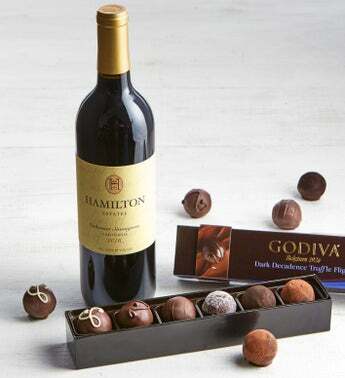 This flight of Godiva dark chocolate lovers' most coveted truffles pairs well with this esteemed California Cabernet wine! Godiva's Dark Decadence Truffle Flight box holds six intriguing dark flavors including Dark Chocolate Vanilla Mousse, Chocolate Souffle, 50% Dark Chocolate, Chocolate Lava Cake, 72% Extra Dark Chocolate, and Aztec Spice. This flight of Godiva dark chocolate lovers' most coveted truffles pairs well with this esteemed California Cabernet wine! Godiva's Dark Decadence Truffle Flight box holds six intriguing dark flavors including Dark Chocolate Vanilla Mousse, Chocolate Soufflé, 50% Dark Chocolate, Chocolate Lava Cake, 72% Extra Dark Chocolate, and Aztec Spice.